Why should a soldier lug around lots of heavy batteries for radios, drones and other uses? Why not just have one big battery that they can cut down to whatever size and shape is needed? That’s exactly what researchers at the Johns Hopkins University Applied Physics Lab have designed, along with scientists from the University of Maryland and the Army Research Lab. Maranchi’s talking about a lithium-ion battery, the kind most commonly in use in small electronics today, but the team has made a fundamental engineering change. 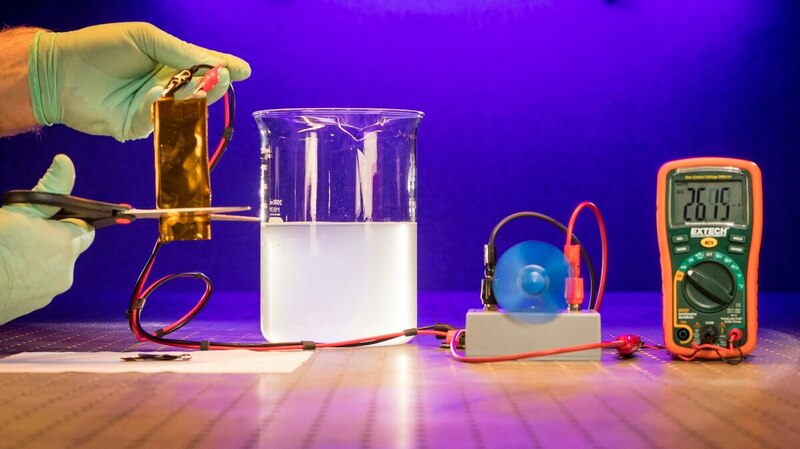 In the paper “Flexible Aqueous Li-ion Battery with High Energy and Power Densities” in the journal Advanced Materials, researchers describe a method for replacing the battery’s usual electrolyte medium with something more simple and stable: Water. Lithium-ion batteries offer high energy density – that’s the amount of energy you can pack into a small container. “But what makes them achieve great performance is also what makes them dangerous,” said Kostas Gerasopoulos, senior research scientist and principal investigator at APL. These batteries typically are volatile: They can explode or catch fire, making them hazardous to transfer or store. Researchers, in their quest to find a cuttable, flexible, waterproof battery, also wanted to develop a more stable energy source. They say water is the ideal medium. Others have tried using water in place of organic solvents, but they haven’t been able to generate high levels of electrical density. To thicken their mix, the APL added salt. “You’d think that having a lot of salt in water, it would never dissolve. But this salt can be dissolved in very high concentrations, and it suppresses the electrochemical activity of water,” Gerasopoulos said. In layman’s terms: The salt allows the water to build up the kind of energy density found in conventional lithium-ion batteries. That gave the team the kind of safe, stable, high-density energy source they felt would function well in a military setting. Right now, the battery is comparable in charge to a typical cell phone battery, but researchers believe that with some tweaking they may be able to pack in twice as much power. “That means we would be able to power a cell phone with a battery that’s half the size. That is a big win,” Gerasopoulos said. The team then embedded its water-based battery in a resin base, rather than encase it in the usual rigid plastic box. The resin is flexible and can be submersed without impacting battery performance. It can be cut and shaped to suit a variety of uses. 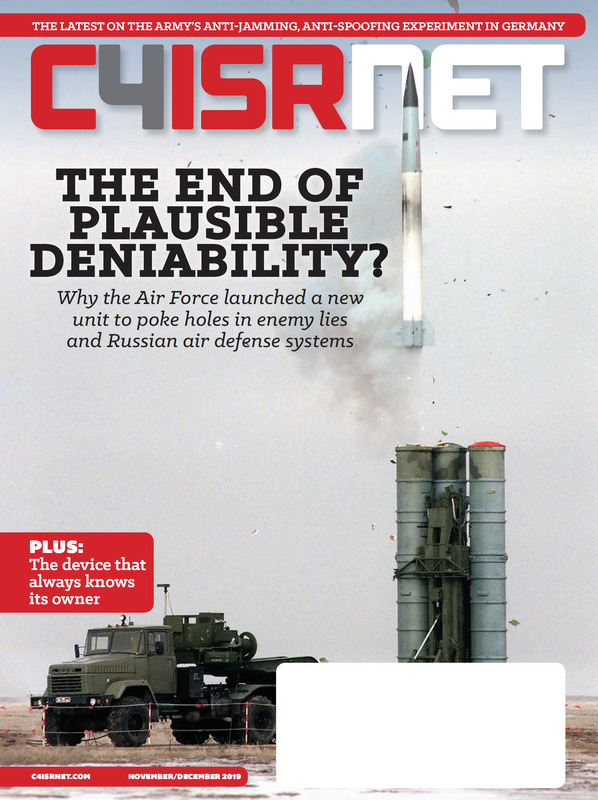 In the lab, researchers have cut the battery, immersed it in seawater and even subjected it to ballistic testing. The battery has delivered power and performance through all these tests. Researchers expect it will be three to five years before soldiers are able to head out into the field with sheet of all-purpose battery rolled up in the back of the Humvee. Before then they need to do more extensive field testing in coordination with their Army partners.